Ever wondered about working from home? Nowadays, it is the most talked about topic especially here in the Philippines where traffic is dreadful and one of the main reasons why a lot of people are considering working from home. Mothers benefit from this kind of set-up as they will have more time for their family. As others learn more about work at home jobs, many Facebook groups are sprouting, encouraging and giving tips to newbies on how they can land their first job and other concerns. One of the many groups there is Filipina Homebased Moms (FHMOMS). 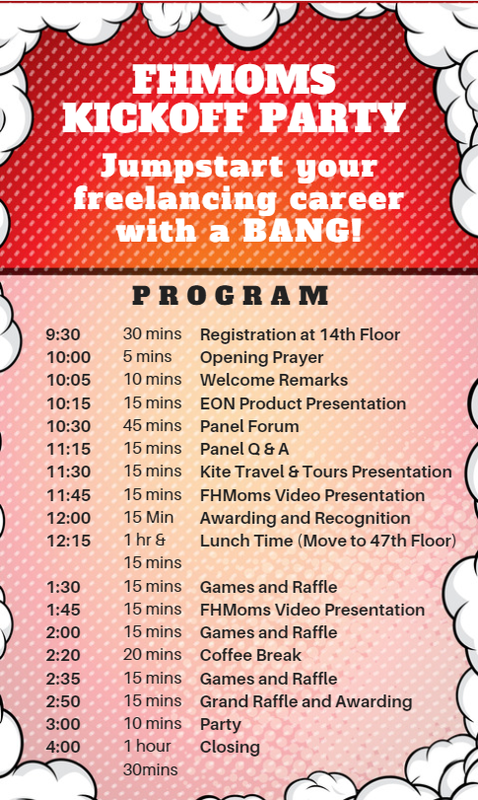 FHMOMS is a community of Super Pinay Moms with a mission to help fellow mothers to take the first step to freelancing, to share the passion in learning skills, and to enhance the ability to juggle both responsibilities of being a mother and a freelancer. Well, I am not here to discuss working from home. I also wished to have a fulltime work at home, but I don't have the courage yet. Yes, I do part-time blogging and some social media related stuff but I still have a long way to go. So while learning my way thru it, I joined events and groups that will help me in time. 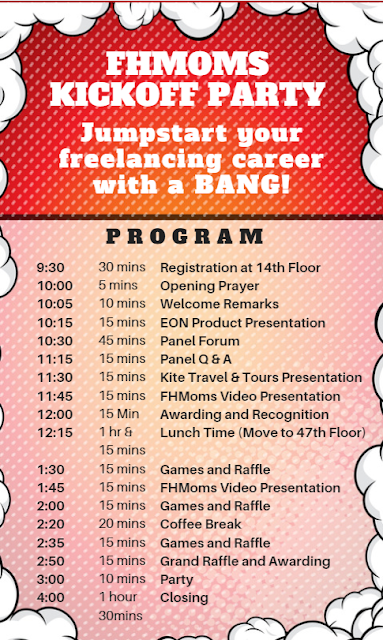 That is why I am inviting you all to take part in FHMOMS Kickoff Party happening today! This is a great way to mingle with fellow work at home moms who only connect online. Here's a preview of what's going to happen today, December 16, 2017 at 47th Flr., Unionbank Plaza, Pasig City from 10AM to 4PM. The list of booths is really exciting! There is a booth for kids, insurance, fashion, and beauty. Moms will surely have a lot in their hands on the event itself. Project Playlab Devt Center Inc. 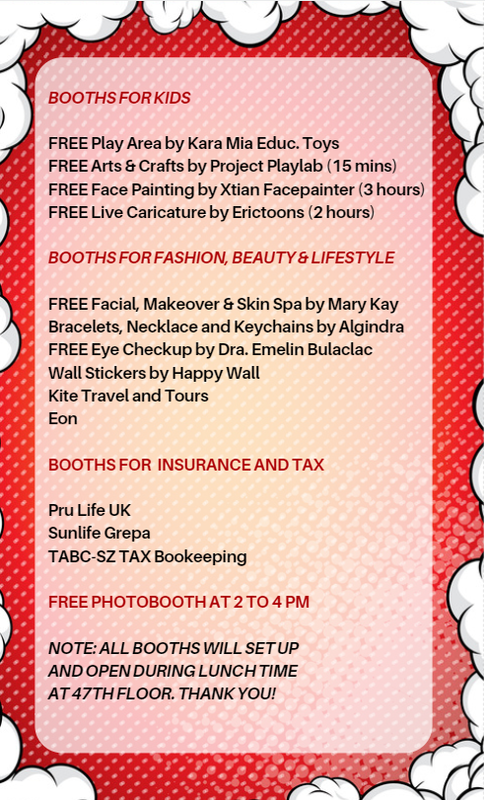 There is a lot in store for all attendees as each and everyone will receive a loot bag plus raffle prizes and giveaways from generous sponsors: Belle Ame Essentials, Kara Mia Educational Toys, Sugar and Spice, Mommy Rach, Digital Nomad, Mermaid Cafe PH, Kite Travel and Tours, Pru Life UK, Algindra, Dra. Emelin Andrea Bulaclac Cortez, Happy Wall, Parfum D' Amor, Moro Moru, Annderground Market, Crumbs by Isabel, Nix Eniego, and 5 Happy Wall Stickers. And this is not possible if not with the help of the FHMOMS volunteers who pledged for their time and effort. Mothers are really a master of their household but even their crafts. Hats off to all the moms who worked hard but still takes care of their family. 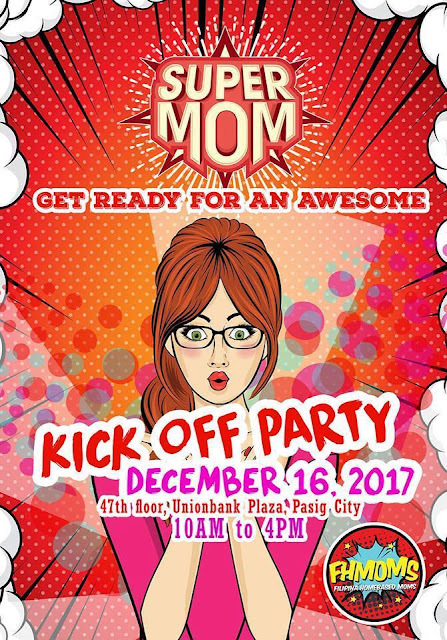 See you all at the FHMOMS Kickoff Party!